Harry Greb had excellent stamina and constantly threw punches from all directions, which is how he got the nickname "The Human Windmill." 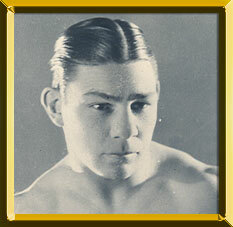 Greb was also considered a dirty fighter, using elbows, thumbs and his head as often as his fists. Greb engaged in 299 bouts Greb outfought some the best fighters of his era. A middleweight champion, Greb dueled top fighters from the heavyweight and light heavyweight divisions. Most amazing about Greb, though, is the physical disadvantage he fought through much of his career with. He was blind in one eye. After getting thumbed in the eye by an early opponent, Greb lost sight in one of his eyes. The use of thumbs is illegal, but it was a tactic Greb himself relied upon. Over the last third of his career, the sight in his "good eye" was declining rapidly and ultimately forced him to retire at the age of 32. Greb is the only man to have defeated Gene Tunney, decisioning him in 1922 for the vacant American Light Heavyweight title. Tunney, who beat Greb in four subsequent matches, went on to dethrone heavyweight champion Jack Dempsey in 1926. Greb captured the middleweight crown by decisioning Johnny Wilson in 1923 and made six successful title defenses. Perhaps his most memorable middleweight conquest was a points win over legendary Mickey Walker in 1925. Greb also fought light heavyweight champions Jack Dillon, Battling Levinsky, Mike McTigue, Tommy Loughran (six times) and Maxie Rosenbloom. In addition, he met top heavyweights Gunboat Smith, who beat heavyweight champ Jess Willard, Willie Meehan, who beat Dempsey, and Billy Miske, who fought Dempsey three times. With his vision getting worse and close to 300 fights taking its toll, Greb lost the middleweight title to Tiger Flowers in 1926 After losing a rematch to Flowers, again by split decision, Greb announced his retirement. He was considering a comeback when he entered the hospital to have a cataract removed his eye and a fractured bone taken from his nose. After the operation, Greb died of heart failure induced by shock from the operation.